From Left to right, Frantz, Wiggins, Breedlove, and Brantingham. Image source. The Speak & Spell was an educational toy designed, developed, and sold by Texas Instruments. The toy consisted of a keyboard - made of 40 raised buttons on earlier models and a membrane on later models, a speech synthesizer, and a ROM cartridge slot. Development of the Speak & Spell began in 1976. The device was introduced at the summer Consumer Electronics Show in June, 1978. By Christmas it was a hit, with a suggested retail price of $50. It was vibrant orange plastic with yellow accents and a green vacuum fluorescent display. The Speak & Spell became a pop culture phenomenon, eventually becoming an integral part of E.T.’s phone-home apparatus in the movie E.T. : The Extraterrestrial. Filming began in 1981 and the movie was released in 1982. Image source. The DataMath Calculator Museum also has pictures of the inside of the Speak & Spell and a lot of other information. An early version of the Speak & Spell from the Smithsonian National Museum of American History. The white top case is probably from the proof run for that part. Image source. Business Week cover, September 18, 1978. Image source. 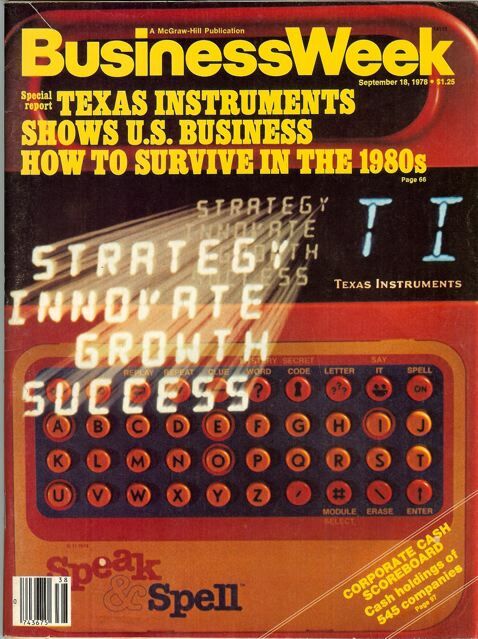 Four Texas Instruments personnel were instrumental in realizing the final Speak & Spell device: Paul Breedlove, Richard Wiggins, Larry Brantingham, and Gene Frantz. Breedlove originated the general product idea, Wiggins dealt with the voice processing, Brantingham was IC designer, and Frantz was responsible for overall case design, display, and operation. An interview with Wiggins is available here. Other similar toys followed in 1980 with a similar design, Speak & Math and Speak & Read. Texas Instrument developed “Solid State Speech” for Speak & Spell. It was the first low-cost, mass produced unit that electronically reproduced speech. The Wikipedia article on the Speak & Spell has thorough and in depth coverage of the device, its history, and operation. Old-computers.com also has an interesting treatment of the Speak & Spell. Photo by Bill Bertram. Image source. Relive the joy of my (your) youth! A Speak & Spell simulator (called SASS) for Windows is available and can be downloaded here. An online Speak & Spell simulator can be found here. Gene Frantz was my manager at Texas Instruments in the early '90s. When I found out he'd invented Speak 'N' Spell, I couldn't speak (or spell) for about 24 hours. Thanks for sharing the info. When I was little (late 70s), my uncle gave me a Speak & Spell. I could barely write a sentence in Dutch (I am originally from Belgium), let alone in English. But over time I learned all the words - at least by sound and spelling. Only later on I learned the meaning of the words. Anyhow, yesterday my mom found the Speak & Spell back in the attic. And guess what? It still works. Pretty sturdy machine. Now I can pass it on to my 3 year old daughter. The Joys of Renovations !